One day Sage Shakti, Sage Vashishtha's son, was going through a forest. Suddenly, King Kalmashapada's chariot blocked his path. In those days, it was customary for everybody to give way to a sage, a blind man, a crippled person or an old woman. But Kalmashapada was vain and did not give way to Shakti. 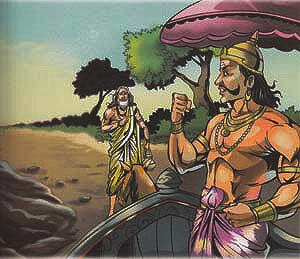 Instead Kalmashapada rudely ordered him, "Move to a side and make way for the chariot. Don't you see that I am the king of this region?" Shakti tried to explain, "I am a sage." But King Kalmashpada was very proud and refused to move. Instead, he lashed at the sage with a whip. At this, Shakti got angry and cursed the king to become the king to become a demon. Sage Viswamitra, who was passing by, saw this incident. He was a big enemy of Shakti's father, Sage Vashishtha and heard Shakti cursing the king. He asked another demon, Kinkara, to enter Kalmashapada's body. When the demon entered his body, Kalmashapada became evil and lost his sense of rightousnesss. He thought that his behaviour had changed because of the curse of Shakti, so he went to Shakti and said , "Your curse has made me a demon. Since you are responsible for this. I will take revenge on you and will eat you up." Saying this, Kalmashapada roared and killed Shakti and ate him. Later, he even killed Shakti's brothers.